To understand how to make liquid jet spray cleaner and more efficient, though, researchers have to focus on the little things: Scientists must observe fluids flowing in atomic, microsecond detail in order to begin to understand one of science's great challenges—turbulent motion in fluids. 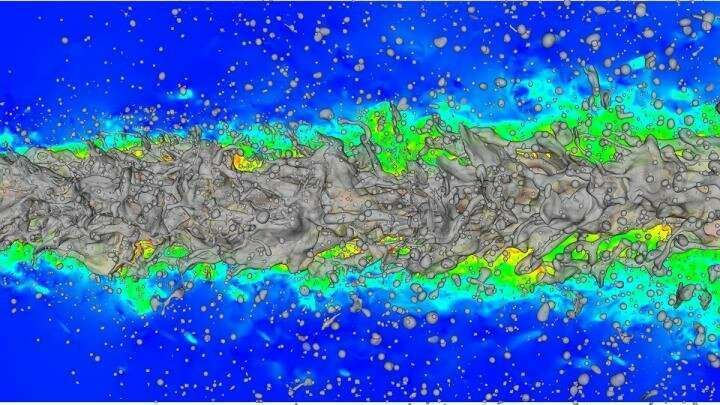 Experiments serve as an important tool for understanding industrial spray processes, but researchers have increasingly come to rely on simulation for understanding and modeling the laws governing the chaotic, turbulent motions that occur when fluids are flowing quickly. A team of researchers led by Prof. Dr. Markus Klein at the Bundeswehr University Munich (German: Universität der Bundeswehr München) understood that modeling the complexities of turbulence accurately and efficiently requires high-performance computing (HPC), and recently, the team used resources at the Gauss Centre for Supercomputing (GCS) at the Leibniz Supercomputing Centre (LRZ) in Garching near Munich to create high-end flow simulations for better understanding turbulent fluid motion. When scientists and engineers speak of liquid sprays, there is a bit more nuance to it than that—most sprays are actually multiphase phenomena, meaning that some combination of a liquid, solid and gas are flowing at the same time. In sprays, this generally happens through atomization, or the breakup of a liquid fluid into droplets and ligaments, eventually forming vapours in some applications. When modeling fluid flows, researchers use several methods. Among them, direct numerical simulations (DNS) offer the highest degree of accuracy, as they start with no physical approximations about how a fluid will flow and recreates the process "from scratch" numerically down to the smallest levels of turbulent motion ("Kolmogorov-scale" resolution). Due to its high computational demands, DNS simulations are only capable of running on the world's most powerful supercomputers, such as SuperMUC at LRZ. Another common approach for modeling fluid flows, large-eddy simulations (LES), makes some assumptions about how fluids will flow at the smallest scales, and instead focuses on simulating larger volumes of fluids over longer periods of time. For LES simulations to model fluid flows accurately, the assumptions built into the model must rely on quality input data, hence the need for DNS calculations. To simulate turbulent flows, the researchers created a three-dimensional grid with more than 1 billion individual small cells, solving equations for all forces acting on this fluid volume, which, according to Newton's second law, give rise to acceleration. As a result, the fluid velocity can be simulated in both space and time. The difference between turbulent and laminar, or smooth, flows depends on how fast a fluid is moving, as well as how thick, or viscous, it is, and in addition to the size of the flow structures. Then researchers put the model in motion, calculating liquid properties from the moment it leaves a nozzle until it has broken up into droplets. Based on the team's DNS calculations, it began developing new models for fine-scale turbulence data that can be used to inform LES calculations, ultimately bringing accurate jet spray simulations to a more commercial level. LES calculates the energy of large structures, but the smallest scales of the flow are modelled, meaning that LES calculations potentially provide high accuracy for a much more modest computational effort. Although the team has made progress in improving LES models through a more fundamental understanding of fluid flows through its DNS simulations, there is still room for improvement. While the team can currently simulate the atomization process in detail, it would like to observe additional phenomena taking place on longer time scales, such as evaporation or combustion processes. Next-generation HPC resources will close the gap between academic-caliber DNS of flow configurations and real experiments and industrial applications. This will give rise to more realistic databases for model development and will provide detailed physical insight into phenomena that are difficult to observe experimentally.